Only available in certain territories. Some stores or copies might inaccurately list Steam as the platform. The PC version is Epic Games Store exclusive. All existing Steam customers will receive updates and DLCs through Steam. Steam version will be available to purchase again on February 14, 2020. Delete or rename credits.webm and legal.webm. 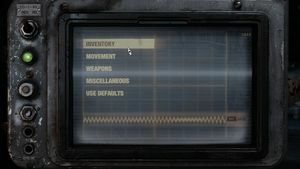 When you start the game with the its .exe (not from Epic Store) the saves will be at %USERPROFILE%\Saved Games\<user-id>\. Note that the two are not synchronized! Default is 60º vertical. See Field of view (FOV). SSAA x0.4-4.0 controlled with "Shading Rate" option. TAA is enabled by default. Change r_base_fov from the default 60 to the desired value (up to a maximum of 90). Increasing the FOV will reveal unfinished player model. Blood overlay (when getting damaged) doesn't scale with FOV. Change r_fullscreen on to r_fullscreen off. Use Special K if you want to force borderless fullscreen window mode. Partial. Two presets. Can also change shoulder buttons to triggers, invert y-axis, change movement stick from LS to RS. General, Aim, Aim Assist, Auto Aim Border. Controller plugged in after game launch, auto detected once a button is pressed. Changes button prompts automatically. Music and Master. Dialog added in Ranger Update. 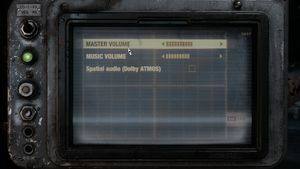 See Different Volume Configurations. 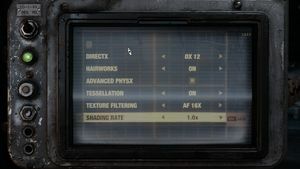 Download and install Rivatuner, add MetroExodus.exe and limit Framerate to 60FPS. 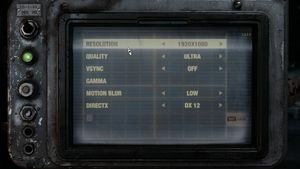 Enabling v-sync through the control panel whilst disabling it in-game can solve this as well. Windows 10 is required for raytracing capabilities. ↑ 1.0 1.1 File/folder structure within this directory reflects the path(s) listed for Windows and/or Steam game data (use Wine regedit to access Windows registry paths). Games with Steam Cloud support may store data in ~/.steam/steam/userdata/<user-id>/412020/ in addition to or instead of this directory. The app ID (412020) may differ in some cases. Treat backslashes as forward slashes. See the glossary page for details. 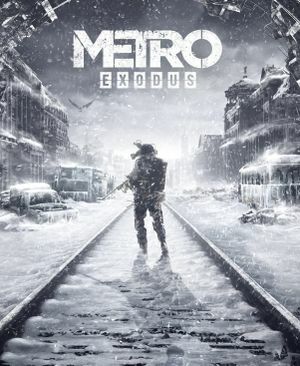 "Your physical copy of Metro Exodus will now ship with an Epic key"
This page was last edited on 21 April 2019, at 10:45.